Gulf of Mexico’s low-oxygen ‘dead zone’ 4th smallest since 1985 — but that’s not all good news. 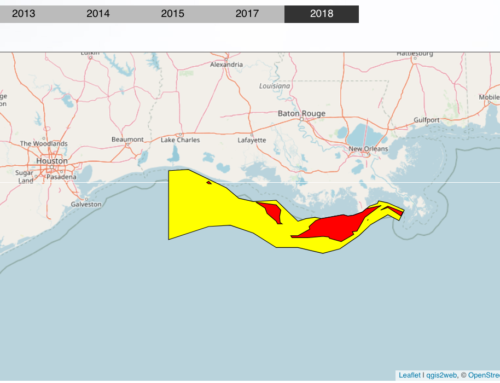 The summertime low-oxygen “dead zone” along Louisiana’s Gulf Coast is dramatically smaller in 2018 — 2,720 square miles, or the size of the state of Delaware — a team of researchers announced Tuesday (July 31). 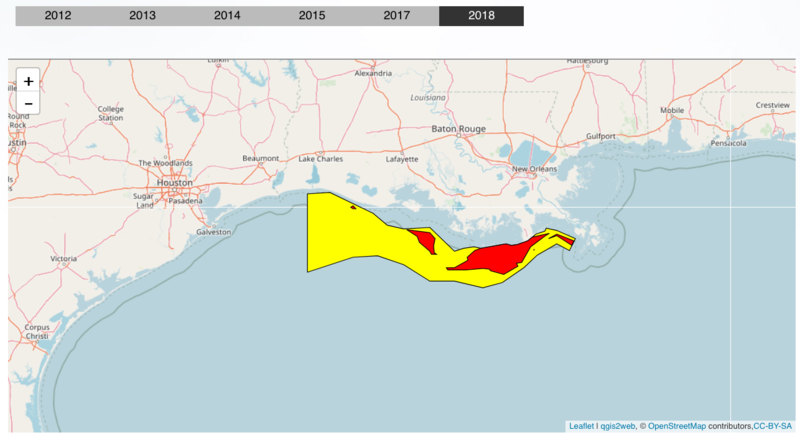 That’s the fourth smallest dead zone since 1985, but it’s still 50 percent larger than a target size set in 2008 by a federal task force concerned about the effects of hypoxia — oxygen levels of 2 parts per million or less in water — on Gulf fisheries. The findings were announced by researchers from Louisiana State University, the Louisiana Universities Marine Consortium and NOAA. This year’s dead zone is significantly smaller than the 5,770 square mile average from 2014 to 2018, and only a third of the size of last year’s dead zone, the largest ever at 8,776 square miles. 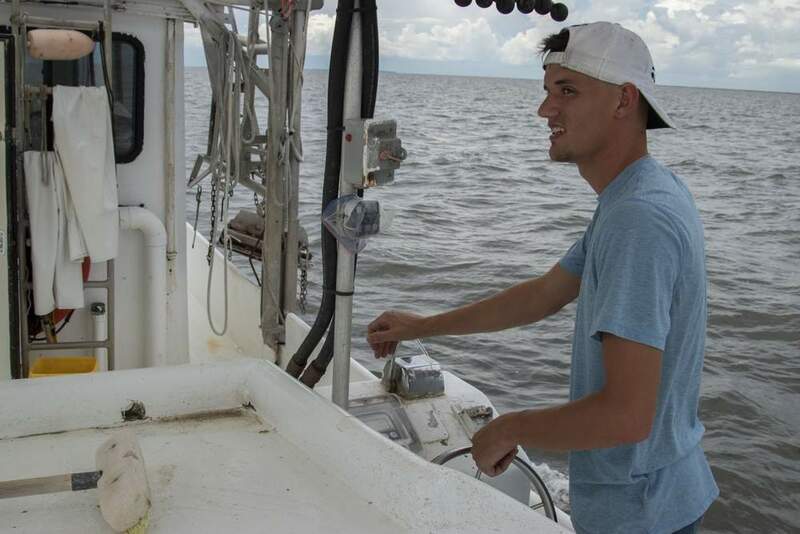 But the much smaller area where the lowest amounts of oxygen were found this year may not tell the whole story, said marine scientist Nancy Rabalais, who has led the annual measurement cruises for 32 years for LSU and LUMCON. Strong winds out of the west and northwest in the weeks just before the July 24-28 monitoring cruise likely pushed the largest concentrations of low-oxygen water into the eastern part of the Louisiana shelf, she said.In the eastern area, water with only 2 ppm or less were found in the lower half to two-thirds of the water column there, compared with previous cruises where the lowest oxygen content was not found that high in the water column. It’s in that area that those on board spotted blue crabs at the surface, clearly trying to escape the suffocating low oxygen levels near the bottom, she said. 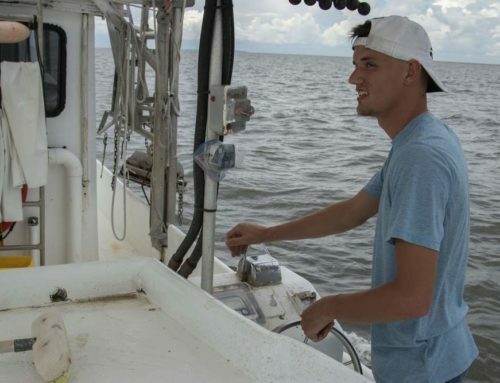 In that same area, from Port Fourchon to Elmer’s Island to Grand Isle, fishers have been reporting dead fish washing ashore in recent days, “like a Jubilee gone bad,” Rabalais said, referring to incidents where fish beach themselves to escape low-oxygen waters. 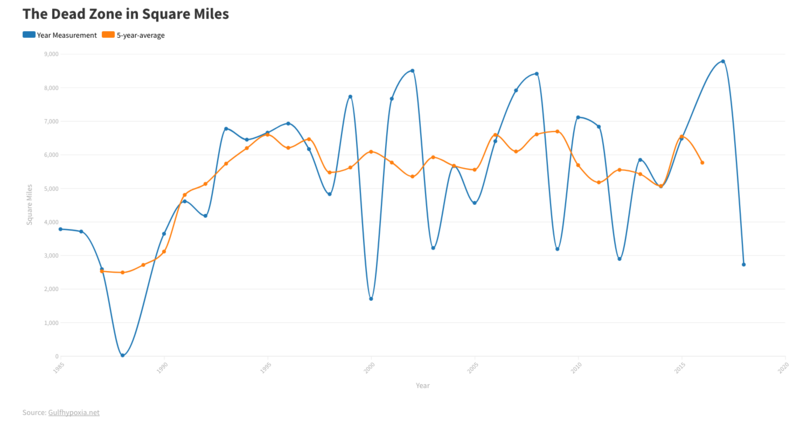 ‘Dead zone’ caused by nutrients from Midwest In a news release explaining the oxygen-sampling trip, Rabalais pointed out that this year’s results were similar to other years that had similar weather patterns, including 2014, when the low-oxygen area was 5,052 square miles. That year also had the lowest oxygen readings in the eastern part of the sampling area. 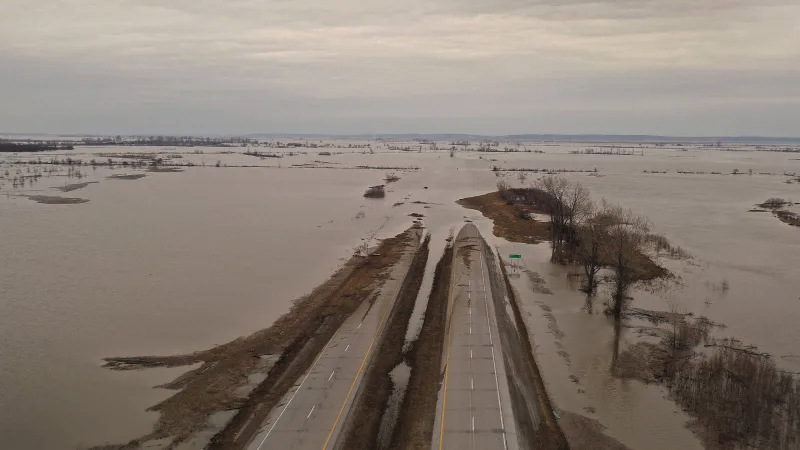 The low oxygen conditions are linked to nutrients — nitrogen and phosphorus — that travel with springtime floodwaters down the Mississippi and Atchafalaya rivers from Midwest farms and sewage facilities to the Gulf. The freshwater and nutrients feed phytoplankton, tiny one-cell algae, that bloom along the surface, die and sink to the bottom water. There, they’re broken down by microorganisms, using up the oxygen in the water. The freshwater at the surface forms a layer that doesn’t allow oxygen to mix into the deeper water until either tropical storms during the summer or frontal storms in the fall act as blenders. 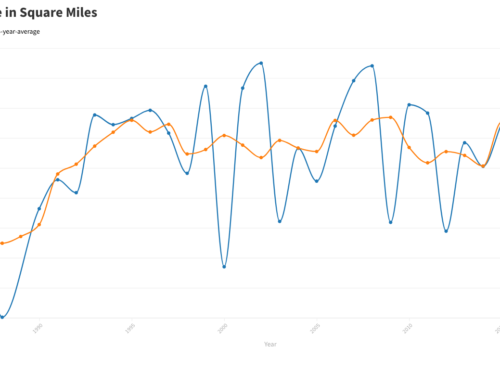 This year’s smaller dead zone also comes as a surprise because the amount of nutrients carried by the river in May was at near-record levels. LSU oceanographer Gene Turner had predicted then that, based on the river’s nutrient levels, the dead zone would be 6,570 square miles. She said NOAA is committed to continuing to support the annual research cruises “as part of our involvement with the Hypoxia Task Force,” adding that the agency hopes that long-term funding will become available later this year through the task force and the federal-state Cooperative Hypoxia Assessment and Monitoring Program. 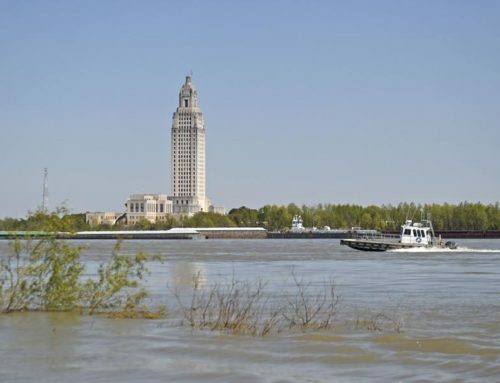 Doug Daigle, chairman of the Lower Mississippi River Sub-basin Committee, which focuses on nutrient issues in states along the river, said the task force’s action plan, which aims to lower the size of the dead zone to a five-year average of only 1,930 square miles in the Gulf, is expecting Congress to approve money for upstream conservation measures in both the 2018 Farm Bill and the proposed Water Resources Development Act for 2018. 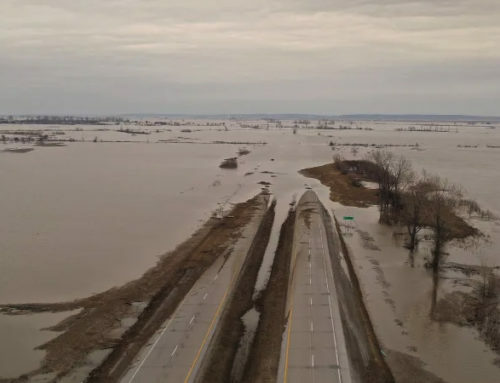 “Ecosystem restoration, floodplain restoration, and wastewater treatment projects in the Mississippi, Ohio, and Missouri River basins can be of significant help, if they’re funded,” Daigle said. Leslie Smith2018-09-18T10:47:13+00:00July 31st, 2018|News|Comments Off on Gulf of Mexico’s low-oxygen ‘dead zone’ 4th smallest since 1985 — but that’s not all good news.